Yeah. I know exactly what you mean. Gotta admit I've always been a bit of a slag. Promiscuous female, in British slang. Derogatory, obviously. I'm taking it back. I'm a right slapper. It's time we talk about the thing we refuse to talk about; our ingrained extrovert-biased society and how it hurts the introvert from ever being a truly successful, socially accepted person without having to hide their true selves in public. Hilary Clinton is probably an introvert. I think you're confusing introverts with being shy, I'm an introvert but I'm also confident in social situations. My work is highly dependent upon having good people skills and being able to manage in large groups of people. I came into this thread hoping for a bit of quiet and common sense. I deny that you are an extravert! You're enabling my bad habits! Ones company, twos a crowd. That's what the voices tell me! I'd explain the difference introversion and shyness, but I'm too busy reeling from the other threads. Sorry. Also, refer custom user title. I would like to know about your introverted crotch. I was expecting the poo thread. Though I do slightly balance more to the extrovert, It is like 53-47 on the Meyers Briggs Test so I am classified as an ambivert. 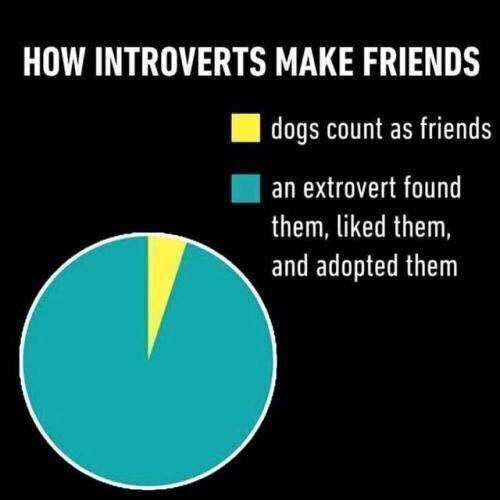 I do have a habit though of collecting introverted friends and most of the guys I dated were introverts. I was going to say something, but I have to build some energy before a prolonged discussion on it.